Gastrology were recently whisked away to beautiful Tasmania by Huon Aquaculture to go behind the scenes with Huon Salmon and find out what sets Huon Salmon apart. Huon Aquaculture are leaders in fish aquaculture and the proud producers of Huon Salmon. The majority family-owned and operated business is committed to ethical and responsible farming and their unique process ensures all salmon is of the highest, freshest quality. 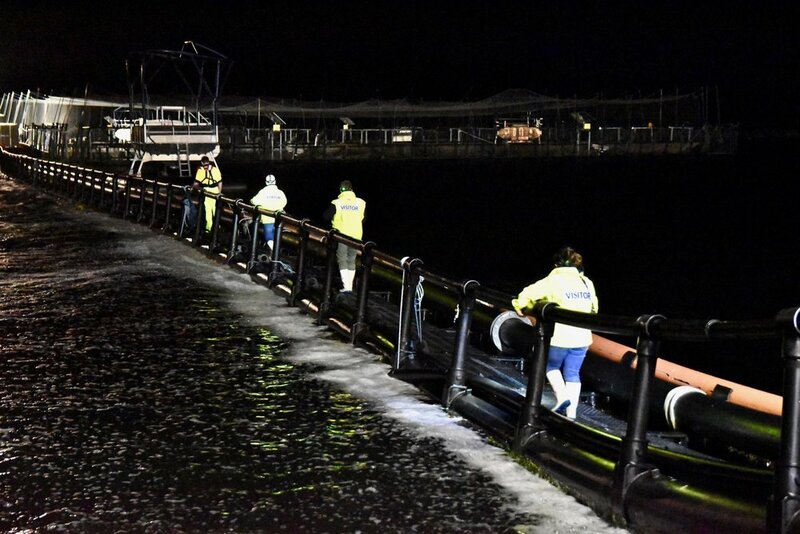 To ensure freshness, Huon Salmon are uniquely harvested at night and travel in the early hours of the morning direct to their facility in the north of Tasmania where they are processed and shipped to customers across Australia. 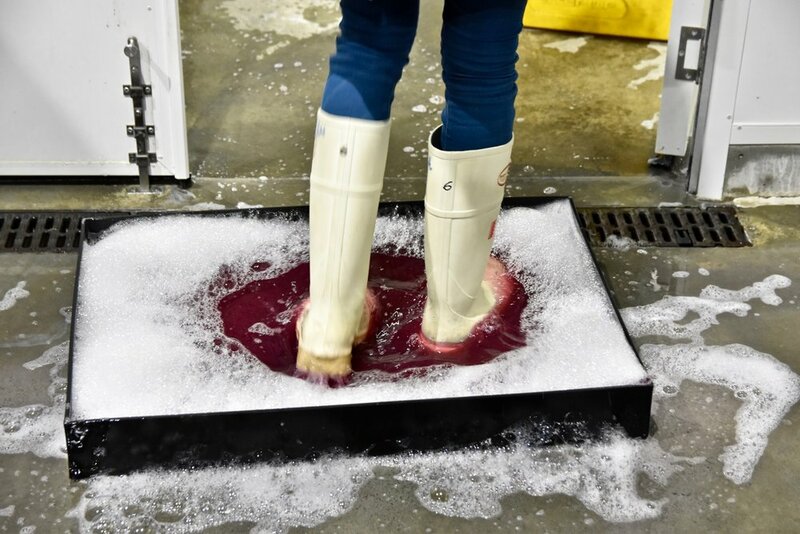 This is why Huon Salmon is a whole lot fresher. Huon Salmon also take an ethical and responsible approach to their farming and have developed the ‘Huon Method’, which is a philosophy that guides everything they do in the hatchery, on the farm and in the smokehouse. This includes ensuring the health and welfare of the fish so it lives in a stress free and pristine environment and are fed the highest quality feed available. The entire farming process ensures that Huon Salmon is farmed and delivered to the mainland and supermarkets just in time. This ensures that the freshness of product is carried through from every moment of the process. We were privileged to meet founders Peter and Frances Bender who commenced salmon farming in the early 1980’s in the beautiful waters surrounding their farming property at Hideaway Bay in Southern Tasmania. (That's Peter on the super cool motorbike!) What began as a diversification to the family cattle and sheep farming enterprises soon grew into a highly successful business. 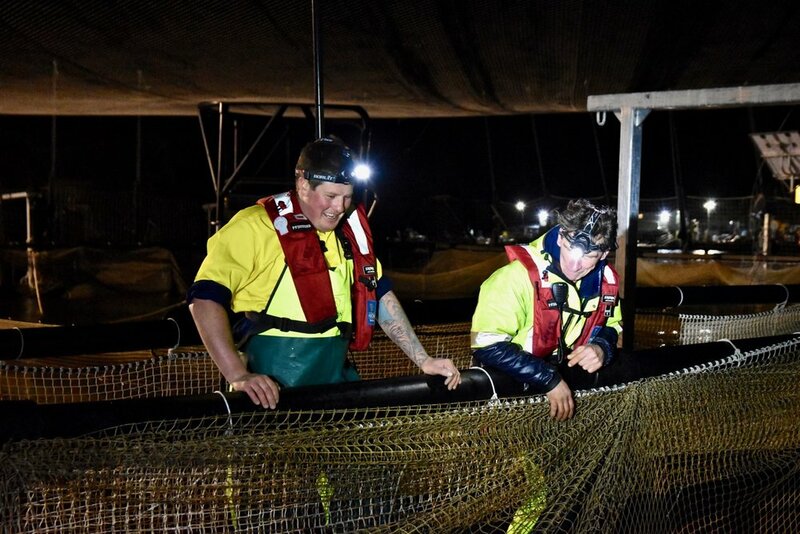 The entire Huon team, from biologists to welders, divers to factory hands, accountants to truck drivers all play their part and take pride in producing Huon Salmon. 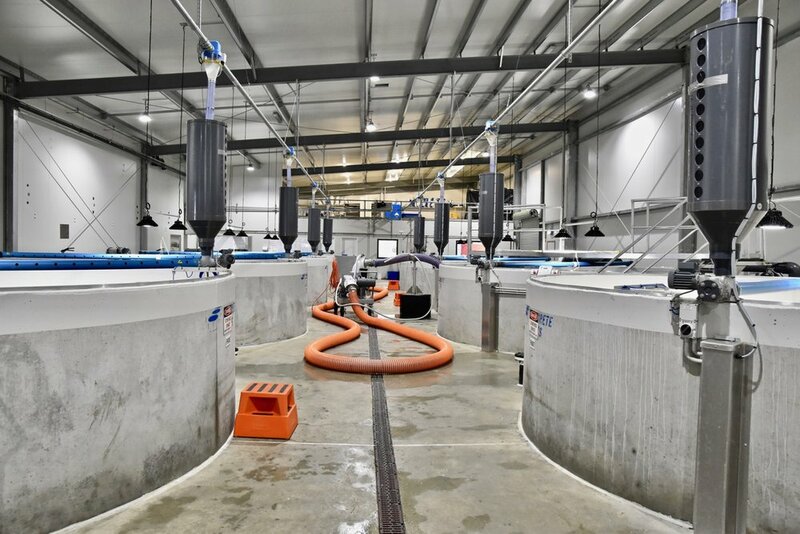 The Hatchery is where the lifecycle starts for Huon Salmon. Eggs are kept at different temperatures to slow their development or speed them up. This is how Huon can supply salmon to the market 12 months of the year. When the eggs hatch the ‘fry’ feed off the egg sack. Once that is consumed they swim up to the surface to have their first feed. They are then moved into progressively larger and larger tanks and are manipulated into thinking it is a certain time of the year by using lights. When they have grown to around 200g in size they go through a change in physiology called smoltification where their body changes to be able to handle living in salt water instead of fresh. During this process, they are pumped into converted milk tankers and transferred to the farm sites. Salmon are a temperate species. They evolved in the cool, high latitude waters of the North Atlantic, an environment which provides well defined seasons that drive the natural life rhythm of the salmon. Although far from the Atlantic Ocean – unspoilt and remote – the pristine waters of the Huon River, Hideaway Bay and the Southern Ocean in Tasmania Australia have proven to be the ideal location to raise healthy, flavoursome Huon Salmon. With water fed by tributaries that start in World Heritage Wilderness Areas, air that’s refreshed by the famous Roaring Forties and fertile soil that spawned flourishing apple orchards, Atlantic salmon thrive in the unspoilt environs of Tasmania. Tasmania is also free from a number of parasites and diseases that have effected some salmon colonies around the world. To this day, Huon attributes the quality of its salmon to the philosophy of ‘getting the basics right and attention to detail’. Focused solely on the goal of growing the best quality in the world, Huon set a high standard from the very beginning to ensure everything else would fall into place. From proudly farming with the lowest stocking density by a commercial fish farm in the world (Huon Salmon only take up 1% of the pen to 99% water), to farming in the most exposed offshore sites in the world, Huon are proud to have a focus on continual improvement through innovation when it comes to farming. 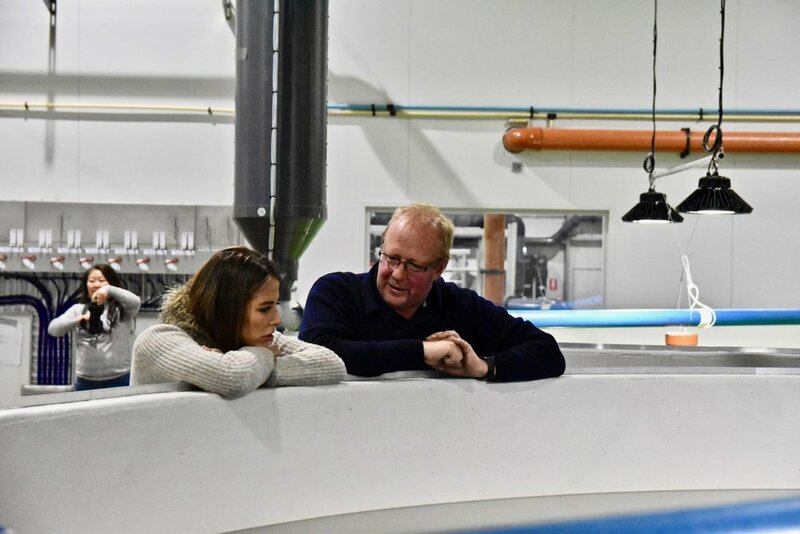 One of the best parts about going behind the scenes at Huon Salmon was meeting all the amazing people at the farm, working passionately behind the scenes. We had the opportunity to taste the Huon Salmon range which includes sashimi grade Fresh Huon Salmon, Huon Premium Smoked Salmon (hot & cold varieties), caviar and pâté. After the tasting, we cooked up a decadent Huon Salmon centric feast for the Harvest Crew that go out every night to harvest the Huon Salmon. After dinner, we headed out into the night (head lamps and all!) to visit the harvest pods at Huon’s harvest location in Hideaway Bay. The harvest system utilises the natural instincts of the Huon Salmon to swim into a current. 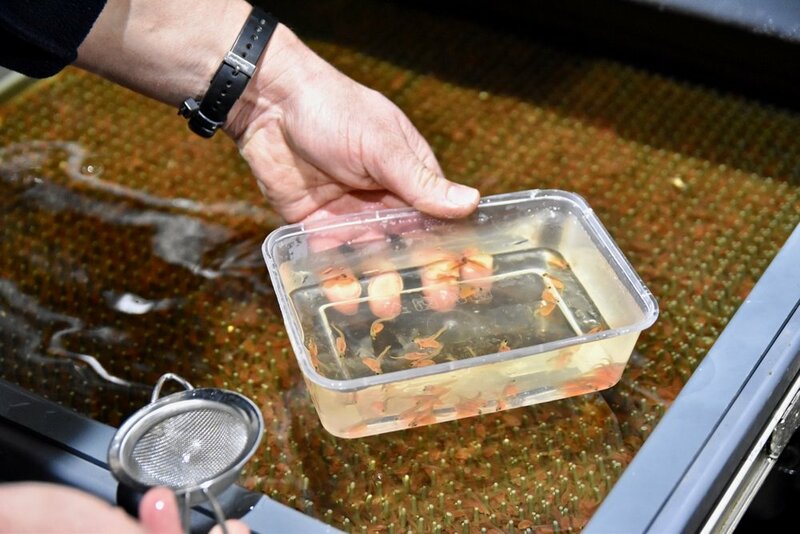 They are gently crowded up into small batches in a pen and pumped up into the Huon harvest system, where they then swim into a current as if they were swimming upstream, before being pneumatically stunned in the head and then milliseconds later their gills are cut. This system was developed in collaboration with Huon on their farm and is RSPCA UK awarded for humane harvesting. It is now considered best practice and exported around the world to other salmon growing regions.